After over two decades inside the Historic North Market, Bluescreek Farm Meats is relocating and expanding operations to better serve customers. Expansion to include butchery classes, fresh cuts of hormone-free/anti-biotic free meats, restaurant, Ohio made grocery items and more. Things just got a little more exciting in Plain City, Ohio. 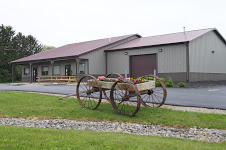 The family-owned farm and butchery has been serving the Central Ohio community at the Historic North Market since 1993. In fact, the family operated inside the Quonset Hut before the North Market relocated to the Advanced Thresher warehouse at 59 Spruce Street in Columbus, Ohio. According to Co-owner David Smith, "By having our own market closer to our farm, we will not only be able to service our loyal customers but introduce ourselves to an entire new population that did not prefer to travel to downtown Columbus." While there has been positive substantial growth in the areas flanking the North Market location, the growth has lead to more difficulties within the Bluescreek customer base including parking, road closers as well as the change in Market operations by extending hours and increasing the hours required at North Market. Furthermore, by being across the street from the Convention Center and large corporations the demand has grown for prepared foods. Unfortunately being within the Market did not allow us the opportunity to offer prepared or "grab and go" foods. In addition, being the farmers, caregivers to our animals as well as being the butcher has been taxing on our family. According to Marketing Director Jamie Smith-Johnson, "We can't adequately service our customer and take care of the farm without an optional day off. We are a family business and we always required a family member be present at the North Market, that is a strong part of our business model and always has been" states Smith-Johnson. This is an exciting time and the offerings will be expanding because operations will be close to the Smith family farm. The new location will not only have the quality meats customer's have come to expect from Bluescreek Farm Meats, but the location will act as a community market where customers will be able to pick up locally-sourced grocery items including Snowville Creamery (dairy), Honeyrun Farms (honey), The Mustard Man (mustard), CaJohn's Fiery Foods (hot sauces and salsas), Ben's Sweet & Spicy (BBQ sauces), Troyer's Deli Meats & Cheese as well as seasonal produce. Locally made gift items are also available if you are looking for a unique gift for yourself or that special someone. Bluescreek Meats and Market will also offer many gluten-free items for those with special dietary needs. Family events as well as classes are to be part of the new location with themed weekends on deck. In fact, one weekend a month is already set, Chocolate Sin Weekend. Bluescreek will continue with their Butchering and Sausage making educational programs. A restaurant will open in the Summer serving-up made-from-scratch deliciousness including freshly made specialty burgers, soups, salads and "to go" meals for the entire family and crafted pastries and pies by artisan bakers. Seating inside and outside will also be made available. For those customers that may not be able to make the trip to Plain City, Bluescreek Farm Meats & Market is currently finalizing a delivery service to Downtown Columbus at the North Market at North Market Poultry and Game. In addition, during the months of July and August they will be set-up up a pop-up butcher shop at a Columbus Farmers' Market (TBD). Bluescreek Farm Meats last day inside of North Market is Sunday, May 29th from 10 a.m.-5 p.m. The Plain City location is currently open: Tuesday though Friday, 10 a.m.-7 p.m; Saturdays 9 a.m.-6 p.m. Closed Sundays and Mondays. For more information, visit Bluescreek Farm Meats & Market on the web at http://www.bluescreekfarmmeats.com or contact them at (614) 504-6605.